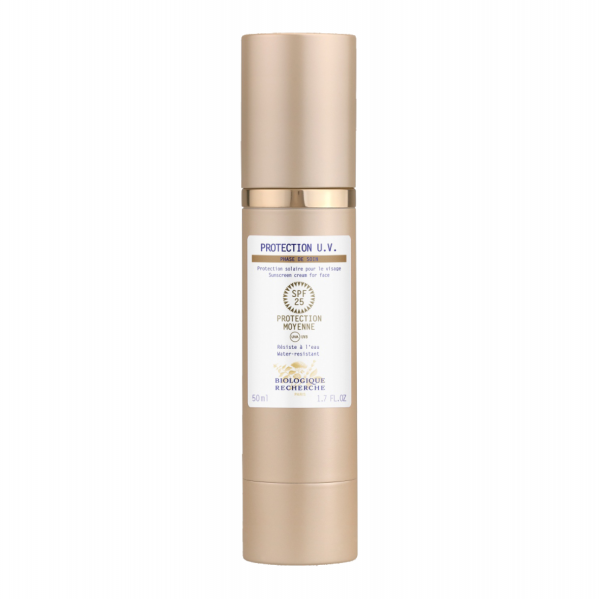 This U.V protection is 100% natural with plant based active ingredients. This protects the epidermis from sun rays. It is also a rich anti-aging, anti-spot cream. Recommended for all Skin Instants exposed to strong UV and infrared rays. Apply generously to the entire face, neck and cleavage area before sun exposure. Thanks to the synergy of 100% natural non-nanoparticulate mineral filters and innovative plant-based active ingredients, Protection U.V. cream helps protect the epidermis from the harmful effects of UVA, UVB, and infrared rays. Furthermore, this formula rich in soothing and moisturizing active ingredients helps prevent dehydration. Recommended for all Skin Instantsexposed to UV and infrared rays. Apply generously to the entire face, neck and décolleté before sun exposure.